Axess Technologies is pleased to announce the publication of our new book 'Influences for Packaging to 2023'. Click here for more information. It is our business to understand technical innovations and how these may be successfully utilised or commercialised. We support our clients in building and implementing successful and comprehensive market strategies. We also provide specialist technical and project management services. Our clients are based in Europe, North America and Asia and we work with Government Agencies, brand owners, issuing authorities, Associations and suppliers. Our brand protection and security expertise allows us to support clients in the fight against criminal activity, such as product counterfeiting, tampering, unauthorised trade and theft. To meet our customers’ requirements we offer flexibility in scheduling, pricing and project design. We run long term and short term projects with set deliverables, as well as retainer contracts and ad hoc work which is charged by the hour. 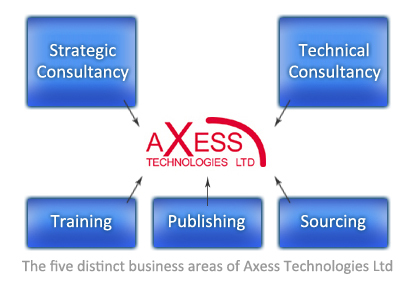 Axess Technologies Ltd is an independent company, with no affiliation to any product suppliers. All clients are therefore assured of professional and impartial advice. Axess Technologies Ltd understands the need for strict confidentiality and security. For this reason mutual confidentiality is adhered to throughout all our projects. We offer a wide range of expertise to our clients and therefore they often phone us first if they have any questions on issues regarding new product launches or existing product protection.